In this article, Hartland Park Animal Hospital – conveniently located in Lexington, Kentucky (KY) – is here to provide you with information on complete and balanced nutritional food for dogs. Contact us today for all of your veterinary needs. To have a healthy dog, they must receive a diet that is well-balanced. There are numerous nutritional requirements that have to be met for the welfare of your pet. Dogs are not true carnivores, so their diet does not have to be meat based. The species has evolved over the years to handle an omnivorous diet. Their intestinal tract and tooth structure have adapted to the change in what they eat. Dogs are now able to achieve their nutritional needs by consuming a combination of plant and animal foods. 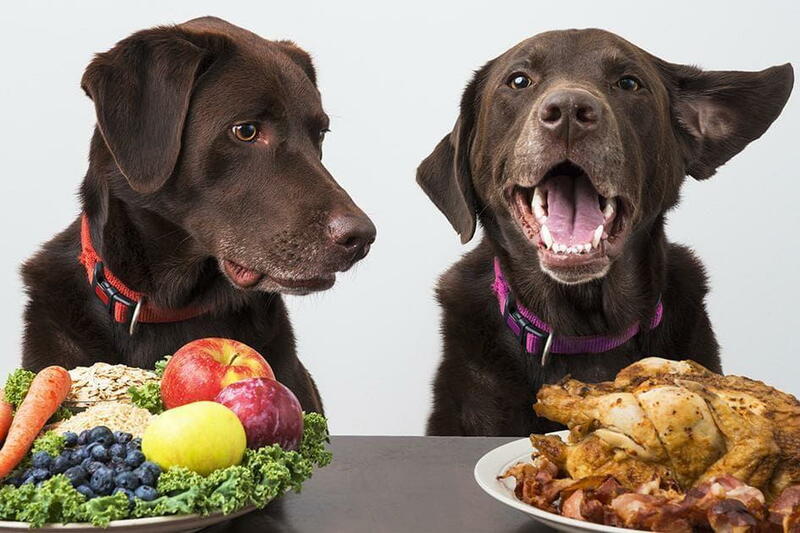 Dogs can even thrive if they are fed a balanced vegetarian diet. However, a diet comprised solely of meat would not satisfy a dog’s nutritional needs. Dogs have to have a suitable number of vitamins, minerals, specific essential amino acids, and certain essential fatty acids. When attempting to find suitable pet food, it is recommended that your feed your dog the highest-quality food you are able to afford. The differences between budget food and premium food are in the source of ingredients and the quality. While both foods can contain the same amount of protein for example, the digestibility of the food is still different. When it comes to dry or wet pet food, there is no difference in terms of digestibility and nutrition. Canned food can be beneficial if your dog needs to consume more water or has special dietary requirements. However, most dogs are able to thrive on just dry kibble. Ultimately, your choice of diet should be based on preferences, budget, and lifestyle. During the varying stages of a dog’s life, their nutritional needs will change. Simply giving them a diet that is formulated to work for all life stages may not suffice. A pregnant dog and a growing puppy may not receive enough nutrients from eating “all-purpose” dog food. The same food can even provide too much nutrients to inactive or senior dogs. It is recommended you feed your pet according to their current stage in life. Following this advice will maintain your dog’s health and improve the quality and quantity of their life. When inspecting the label of pet food, the most crucial thing it should say is "complete and balanced." This statement is certified by The Association of American Feed Control Officials, and they have strict requirements to ensure products live up to the claim. Complete and balanced diets must have at least the minimum amount of the all nutrients required for dogs. Trying to select high-quality pet food from the plethora of formulas and brands on the market can be difficult. The pet nutrition industry is filled with many commercially available foods that can provide very balanced diets. You can always ask your veterinarian to help select the right pet food that meets your dog’s individual needs. For safe and reliable medical care, the trained staff at Hartland Park Animal Hospital is there for your pet. We treat all our pets like they are family by making sure they are safe, comfortable, and healthy. Our high-tech facility is designed to help pets suffering from numerous conditions ranging from broken bones to cancer. We are located in Lexington, KY to provide the highest quality of medical care services to pets in the surrounding area. Call us today.